​In 1894 this and the neighbouring property, forming 1,2 & 3 Westal Buildings were offered for sale by auction following the death of the owner Mr George Winstone. He had for 30 years conducted his Building and Builder's Merchant business from these premises. Altogether the sale consisted of three modern double-fronted shops (presumably tenanted), a dwelling house and a Builder's Yard with double door entrance from the Bath Road. Mr Winstone had advertised the property the year before as he was retiring due to ill health but died before finding a purchaser. Until 1901 this shop was occupied by Mr William Clutterbuck, a draper. He was followed soon after by Mr A Lippatt occupied these premises and traded here in what we today might consider the somewhat unusual combined trade of Fish and Fruit Dealer. He wasn’t there for long however, and Mr A Vacara, Fish Dealer took over and was there for about five years. From 1912 until the late 1960s this shop belonged to two hairdressers. The first was Mr A E Barrett who was there for twelve years. He was followed by Archie Ballinger, a well dressed man who enjoyed the good things in life. Archibald Herbert Ballinger was one of the sons of Charles Ballinger, the butcher, who traded from the shop on the corner of Hermitage Street until 1914. Archie was another of the Ballinger sons to fight in the Great War. It was there that he learnt his hairdressing skills and in the mid-1920s he acquired his shop in Bath Road. It was entered via a short passage and the first sight to meet his customers was a large leather apron hung on the wall. In each of the fifty-two pockets on this apron was a cut-throat razor. Each razor was used for one week and then rested for the next fifty-one weeks. Archie’s assistant, George Price was the shaving expert and many of their customers had their own shaving pot with their name on. In common with many hairdressers in that time, Archie was also a tobacconist. He was an agent for Ronson lighters and used to repair them. Like his father before him, Archie used to visit the young gentlemen at the Cheltenham College just over the road. However, Archie’s visit was much less strenuous for the boys because all they had to do was to sit still and have their hair cut! Archie, whose wife Trixie, had her own hairdressing salon a few doors away stayed at these premises until the late 1960s. In 1969 a paint and decorating shop came to this part of Bath Road, known as The Red House. The premises are now part of the National Westminster Bank plc. After (and possibly before) Mr Winstone's death in 1894 No. 3 Westall Buildings was run by Joseph Bendall as an ironmongers and builders merchant. In May 1896 there was a fire, which was discovered by Mr Bendall as he was closing the shop at 11.20 pm. He had to run to the local fire station to raise the alarm and obtain help (telephones were still uncommon) whilst his neighbours and a posse of policemen, under the control of Inspector Parker, fought the fire with buckets of water. The fire was quickly brought under control but the damage amounted to a considerable £100. For the first twenty years or so of the 1900s this was the business of the London Central Meat Co Ltd, a national chain which also had two butcher's shops in the High Street. It remained in the butchery trade when the Gloucestershire Co-operative and Independent Society acquired it for their butchery department. It stayed in the hands of the Co-op becoming their bakery department at the start of the Second World War. Over the next three dozen years it changed to their fish department, their laundry and finally their dry-cleaners. The National Westminster Bank plc. now own these premises. Bought by the Lord family in the 1880s, this was their home for about 70 years. Henry Lord and his sister Jane remained unmarried and lived here with Mary, their widowed mother. Jane, Henry and their younger brother, Walter were born in Bampton, Oxfordshire. All three were drapers and they had another brother, James, who was a grocer in Wootton Bassett, Wiltshire. In the 1881 census, Walter and his wife, Anne lived in the High Street, Cheltenham with their two daughters, Eva Annie and Agnes Ethel. They had four more children, two daughters and two sons, some of them born after they had left Cheltenham to live in the London area. In February 1894 at the age of just 49, Jane Lord died leaving all her estate to her brother Henry. She was buried in the churchyard at Leckhampton. Henry died seven years later in September 1901 and requested in his will to be buried alongside her. By now, Walter and his family had returned to Cheltenham. Henry having no family of his own, left a share of the drapers business to his niece, Agnes. She was assisted by her elder sister, Eva until the spring of 1909 when Eva died at the tragically young age of 32. Ethel Gertrude, another spinster sister, then joined Agnes and the business continued. Theirs was a very old-fashioned draper’s shop, heated in the winter by paraffin heaters providing a distinctive aroma! During the early 1930s they rented another small shop opposite for Ethel to run, leaving Agnes in the family home. The two sisters were often to be seen ‘popping across’ to each other’s shops for change! Agnes was still at Leicester House when she died in October 1957 at the age of 78. Ethel went to live with her brother, Walter, a house agent, at his home, until her death seven years later. Leicester House was sold in 1961 to the National Provincial Bank, later to become the National Westminster Bank plc. 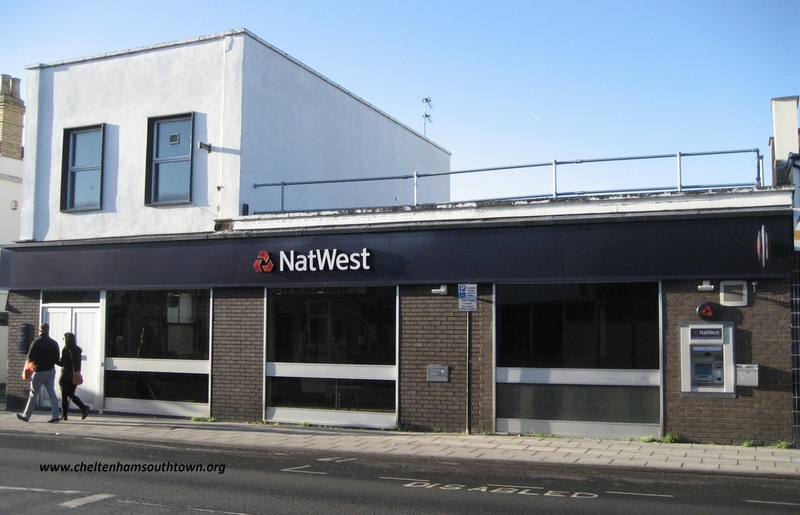 Today this is one of three adjacent properties owned by the bank for their Bath Road branch.